* 4. 10 kopek Coat of Arms 1860 - cancelled "Helsingfors ?. 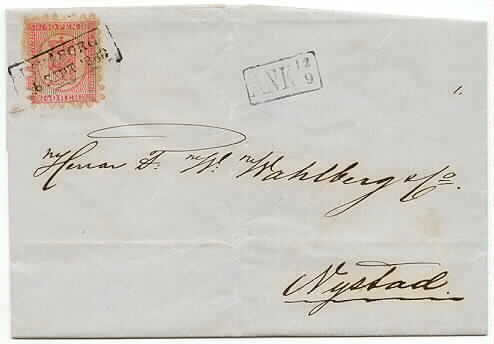 ?.1864" on cover to Nystad. Arrival cancellation "Ank 11 4". Perfect roulette. * 4. 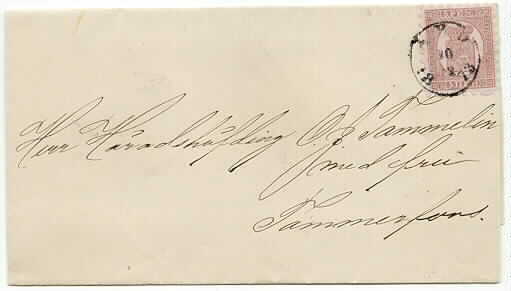 10 kopek Coat of Arms 1860 - cancelled "Helsingfors 23.5.186?" on cover to Åbo. Arrival cancellation. Perfect roulette. * 4. 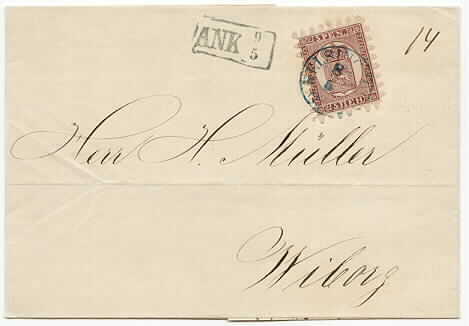 Horizontal pair 10 kopek Coat of arms 1860 - cancelled "Åbo 29.1863" on cover to Stockholm. Arrival cancellation on back. Perfect roulette. * 5. 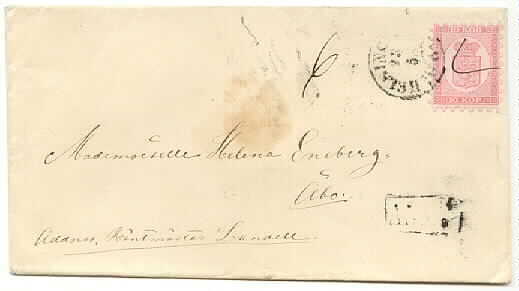 5 penni Coat of Arms 1866 - cancelled "Åbo 10.8.1873" on cover to Tammerfors. Near perfect roulette. * 5. 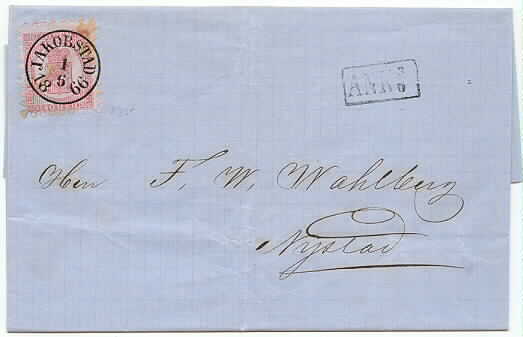 5 penni Coat of Arms 1866 on ordinary paper, roulette III - cancelled "Helsingfors 8.5.1872" in blue on cover to Wiborg. Arrival cancellation "Ank 9 5". A few short perfs. Ex. Mertens. * 8. 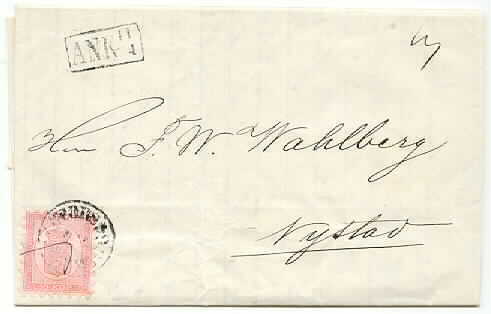 20 penni Coat of Arms 1866 - cancelled "Tammerfors 14.7.1871" on cover to Mustiala. Arrival cancellation "Ank 16 7". Perfect roulette. Fold and tear in top of cover does not affect stamp. * 8. 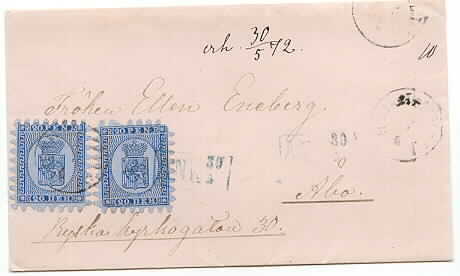 20 penni Coat of Arms 1866 - cancelled "Helsingfors 10.6.1867" on cover to Åbo. Arrival cancellation "Ank 11 6". Perfect roulette. * 8. 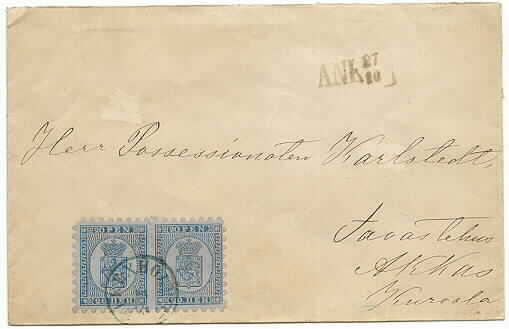 Horizontal pair 20 penni Coat of Arms 1866 - cancelled "Kexholm 2.10.1873" on cover to Kouvola. Arrival cancellation "Ank 27 10". Very good roulette. * 8. Two pcs. 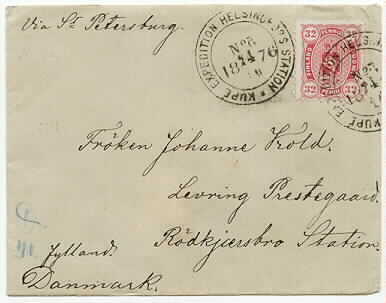 20 penni Coat of Arms 1866 - cancelled "Helsingfors" on cover to Åbo. Arrival cancellation "Ank 30 5" in blue. Near perfect roulette. * 9. 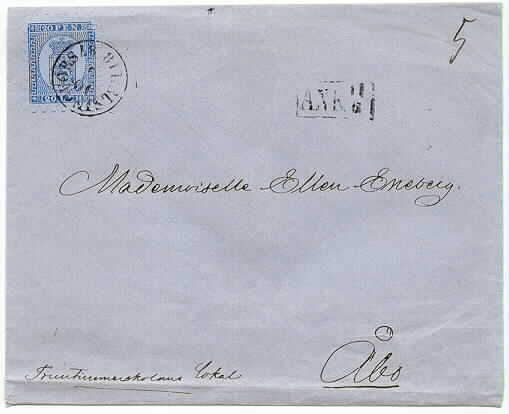 40 penni Coat of Arms 1866 - cancelled "Uleåborg 8 sept 1866" on cover to Nystad. Arrival cancellation "Ank 12 9". A few missing perfs. * 9. 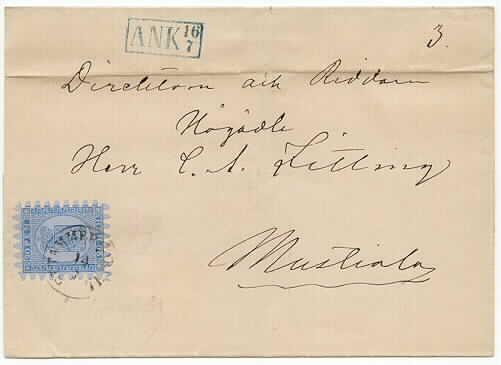 40 penni Coat of Arms 1866 - beautifully cancelled "Jakobstad 1.6.1866" on cover to Nystad. Arrival cancellation "Ank 3 6". Near perfect roulette. * 15 L. 10 penni Coat of Arms 1875 - two pcs. 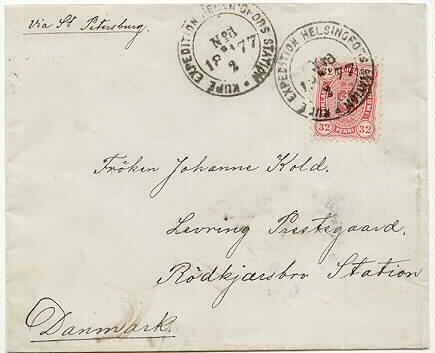 cancelled "Helsingfors 8.12.83" on cover sent to Åbo. Arrival cancellation "Ank 9 12". 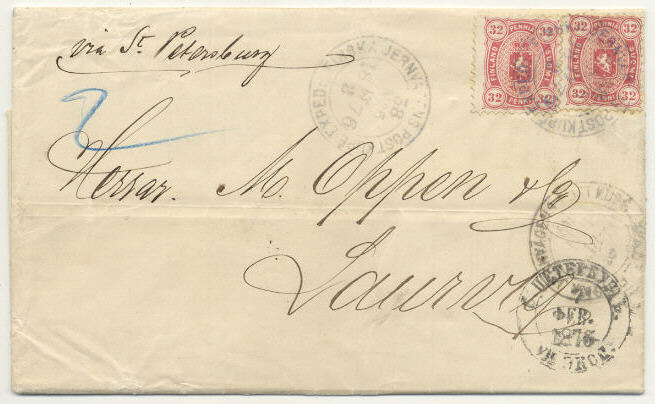 * Facit 18 - 32 penni Coat of Arms - two single copies = 64 penni cancelled "Finska Jernvägens Post Kupe Exped 17.2.1876" on a beautiful double weight cover sent via St. Petersburg to Laurvig. 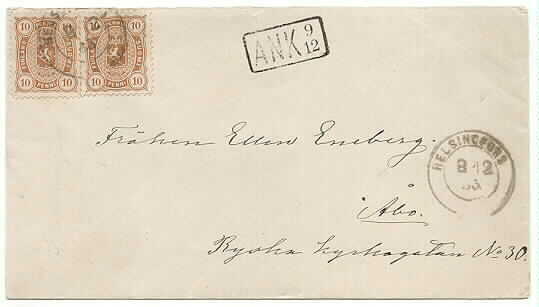 * 18 S. 32 penni Coat of Arms 1875 - cancelled "Kupe Expedition Helsingfors Station 8.2.1877" on cover sent via St.Petersburg to Denmark. Transit cancellation back. 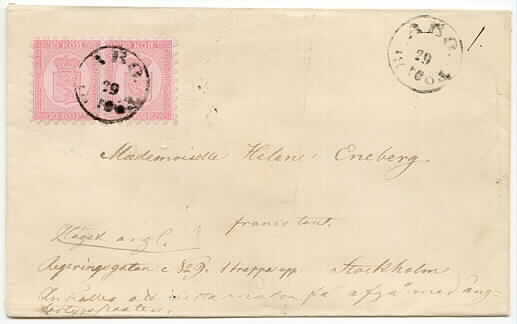 * 18 S. 32 penni Coat of Arms 1875 - cancelled "Kupe Expedition Helsingfors Station 14.10.1876" on cover sent via St.Petersburg to Denmark. Transit cancellation on back. * 165. 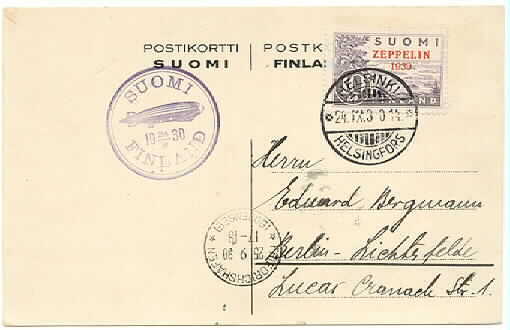 10 mk Zeppelin 1930 - cancelled "Helsink 24.IX.30" on postcard sent to Berlin, Germany. Also special Zeppelin cancellation.